April 07, 2017, 9:51 a.m.
Over a fifth (21%) of consumers have boycotted a brand following a scandal/negative press, a new study from YouGov reveals. The Inside the Mindset of a Brand Boycotter report explores the nature of consumers that stop using a brand, and underlines how vital it is to placate their anger following adverse headlines. It shows that of those who stopped using a brand, three quarters (67%) still don’t. 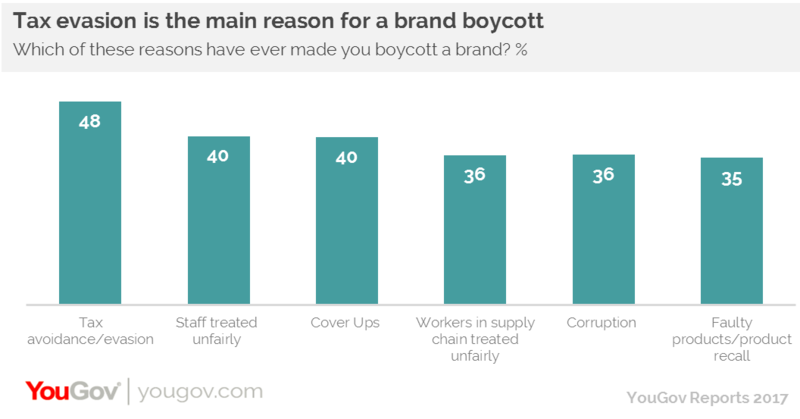 Tax avoidance and evasion is the number one reason for boycotting a brand (55% of those who have stopped using a brand). Four in ten (40%) stopped using a brand because of staff being treated unfairly (i.e. unfair working hours) and just over a third (36%) were prompted by workers in the supply chain being treated badly. YouGov’s report suggests that although some boycotting consumers do come back eventually, rarely do they use the brand as much as they did before. While one in four (26%) went back to the brand they used it less often. Only 1% used it as much as previously. Consumers have mixed reasons for coming back to a boycotted brand. For almost three in ten (28%) they returned because the company changed the practices that had initiated the boycott. Just under a quarter (24%) said they returned because the brand’s product or service improved. However, there are also occasions when a brand does not necessarily need to change its practices or alter its approach. Nearly three in ten (29%) returning boycotters started using the brand again because it had become too inconvenient not to, and over one in six (18%) felt it was necessary to use the company in their work or family life. But there is a difference between how people treat the type of brands that they feel give them something special and those who are seen as one of many. A large majority say they will stick to brands that they like and so the relationship a company has with its customers is key for surviving any bumps in the road.